Snacking is something I am seriously guilty of. It's normally late night binges, seeing friends and boredom at home that lead me to take in all those unnecessary extra calories and grams of fat, salt and sugar each week and I've been tying my hardest to change my ways slowly but surely! So instead of picking up chocolate, crisps, cake and sweets (basically all that junk) I have been grabbing other things to add to my lunchbox and have at home to try and help me change my diet from horrifically unbalanced to something a little more acceptable! As you can see, it's still not a totally crazy-healthy diet - that clearly isn't going to happen over night! But it's got to be better than scoffing a family-sized packet of biscuits and 12 mars bars right? Banana's I've found are great for break times, they really do fill me up until lunch if I'm feeling a little peckish between 10 and 11 and again another portion of fruit! Savoury snacks like Ryvita minis and bites, snack-a-jacks and Special K mini breaks are great! If you haven't tried them yet go out and get some, hardly any calories and they taste so good - I'd pick them over a packet of walkers any day! Peanut Butter.... on everything! I love rice cakes and peanut butter for lunch and spread on sliced Granny Smith apples as a lovely pudding after dinner - don't knock it til' you've tried it! Tea's are obviously a great 'snack' too! They fill you up, keep you hydrated and if you avoid the biscuits then most of the time are 0 cals! I am currently drinking alot ginger green tea along with my favourite Clipper's green tea!! Have you tried any of the foods pictured? What are your favourite snacks - healthy and unhealthy? Some fab ideas, I am too are soo guilty of snacking! This is such a good post!! I love Rivita and Special K! Also addicted to Green Tea, I have it in like 5 flavours. 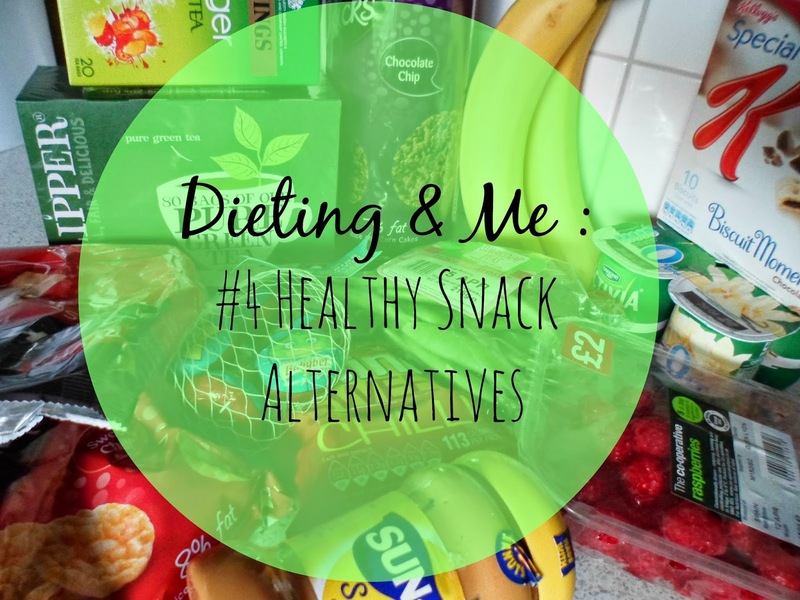 Im a massive snacker so Im always looking for healthy alternatives, especially to chocolate!